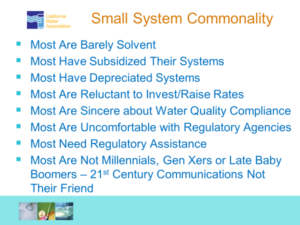 California Water Association (CWA) Executive Director Jack Hawks summarized various solutions the California Public Utilities Commission has established in recent years to address the affordability and sustainability challenges facing utility customers and small water utility systems during a panel discussion at the March 15 symposium in Sacramento hosted by the Regional Water Authority (RWA). Following introductory remarks by Sacramento Mayor Darrell Steinberg, two panels identified challenges and potential solutions for “Making Safe, Clean, Affordable, and Accessible Water a Reality,” the theme of the symposium. The first panel identified the challenges of making safe, clean, affordable, and accessible water a reality from statewide and ground-level perspectives, and panel members shared how their organizations are addressing the challenges. 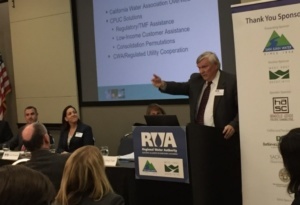 The second panel explored proposed legislative solutions, as well as the solutions being implemented by California’s regulated water utilities. During his presentation on the second panel, Hawks explained the commonality of small water systems and outlined several solutions that the CPUC has instituted in the past 10 years. 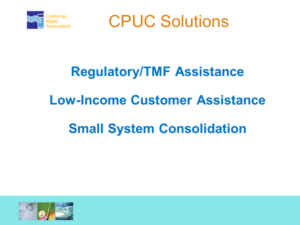 These include: low-income rate assistance (LIRA) programs for customers; consolidating smaller systems; and providing them with technical, managerial, and financial assistance, such as grants, operational assistance and regulatory guidance. Hawks noted that all of California’s largest regulated water utilities offer LIRA programs, which benefit about 19 percent of their residential customers who receive monthly discounts on their water bills averaging about $9.50. Additional information on the symposium, including the seven panelists’ presentations, can be found on RWA’s website at www.rwah2o.org. 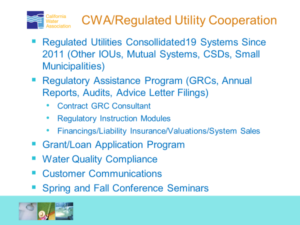 Hawks discusses CPUC solutions at RWA’s symposium.